Through taking this course I wanted to refine how I captured children’s imagination at play. I do love to use props in my photography, but I felt I needed to give them a little more purpose and really be able to infuse the magic into my work. This course gave me the direction I was looking for, from brainstorming all the way through to editing. Below I share some of the assignments and challenges that I had to work though. My first assignment was about finding your ‘anchor’ for your photo session and planning around your theme. I had seen some gorgeous vintage style outfits inspired by Beatrix Potter’s stories, so I set about planning a little mini-shoot based on Beatrix Potter. Here I share my mood board and my final images. For the second assignment, I had to photograph the connection between two subjects. My anchor was a girl and her pony, but I also had to give some thought to the location, props and the wardrobe to support my idea. I knew the weather was going to be grey and drizzly, so working with the available light was my first concern. I looked for images on Pinterest that were taken under grey skies to get a feel for style of photos I would take on the day, and I wanted to create a soft feel through the use of light clothing. I helped my little model to pick out her outfit and we found this lovely wooly waistcoat in her dressing up box which worked really well alongside her sweet pony Mouse. I had to make sure that the location had trees to create some directional light, which is more interesting to photograph than the light available in a big open field. The third week was lots of fun! It was all about being stuck in a rut and being able to get yourself out of it by working through a series of mini-assignments. There were so many great ideas to work with this week and I must make myself a note to go back to them. Some included using one lens only and seeing how many different photos you could create with it, or you could go the opposite way and use every single lens you own (which I tend to do anyway on my sessions – it’s always a mission to find all the lens caps afterwards!). In the first mini-assignment, I had to challenge myself to take 10 unique photos while keeping the model in one spot. I did ok, but I got rather distracted by just how gorgeous and graceful my little ballerina was…I might come back to this one and take on the challenge of doing it properly. I did, however, get lots of beautiful photos of Grace. I've photographed her since and I am now working on a series of In the Wood sessions as I loved the mix of costumes, ballet and woodland locations. The last assignment I had to work on (and just completed recently) was all about being spontaneous – me and my model. For this last photo shoot I was lucky to meet Phoebe, who is sweet, creative, full of energy, but at times over-eager to please others – more on this later. Phoebe’s task was to write down five topics that we could develop into a photoshoot on different pieces of paper and draw one out of a hat. Once we had done this, we were to set a timer to plan the shoot, i.e. find the location, the clothing, props etc. Phoebe pulled out ‘Circus’, and as she loves animals and Harry Potter so much, we had to throw a little bit of everything into the mix. Spontaneity was a little tricky for Phoebe initially. 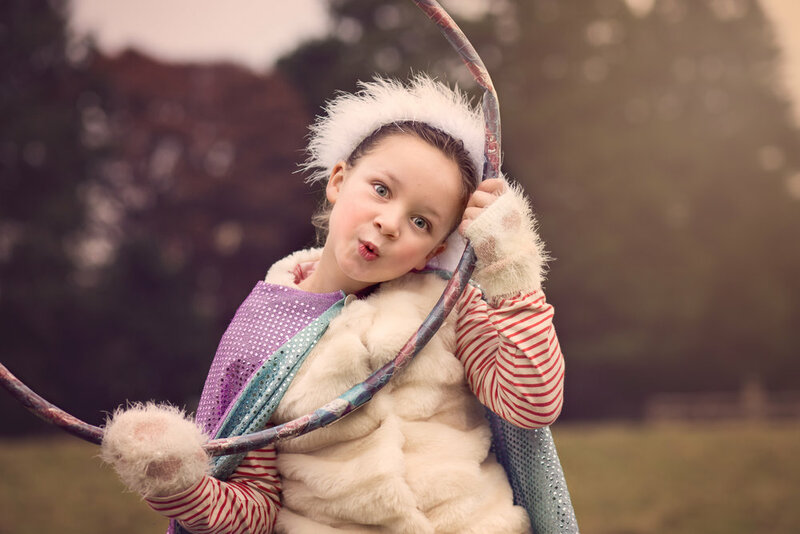 She was wanting direction from us and myself and her mum had to keep reassuring her that this was all about her and she could be whatever she liked – the Magical Ringmaster! She did fall into her role eventually and we came away with some great shots of Phoebe letting her imagination run wild. It was lots of fun for all of us. I hope you’ve enjoyed my blog about Uncovering the Magic of Childhood. I will be launching a series of mini-sessions early next year, so if you would love me to take some photos of your children please send me a message and I’ll make sure you hear about my exciting offers first. In the meantime, enjoy the magic of Christmas!